I was indoctrinated my whole life that fevers are scary and hapless occurrences that need to be managed and done away with. Now that I am grown, and in charge of the care of not only myself and my child, (and my husband too– ladies, who am I fooling here? 🙂 ), I have begun to question many of the things I believed to be true from my childhood. When my daughter got her first fever, I tried to play it cool, like any new mama does, (ha ha), and wanted to take the best course of action. Over the past decade especially, I have increasingly become what my friends and family affectionately refer to as “crunchy,” and what I refer to simply as taking a holistic and natural approach. Labels and emotional attachments aside, (please), my gut instinct told me not to fear the fever byt to support the symptoms. It was hard as a mama, to watch my little baby feel icky and to not be able to take her ailments away, but I trusted the fact that the human body is amazing and that a fever is a beneficial way for the body to attack the illness in an effort to heal what ails. 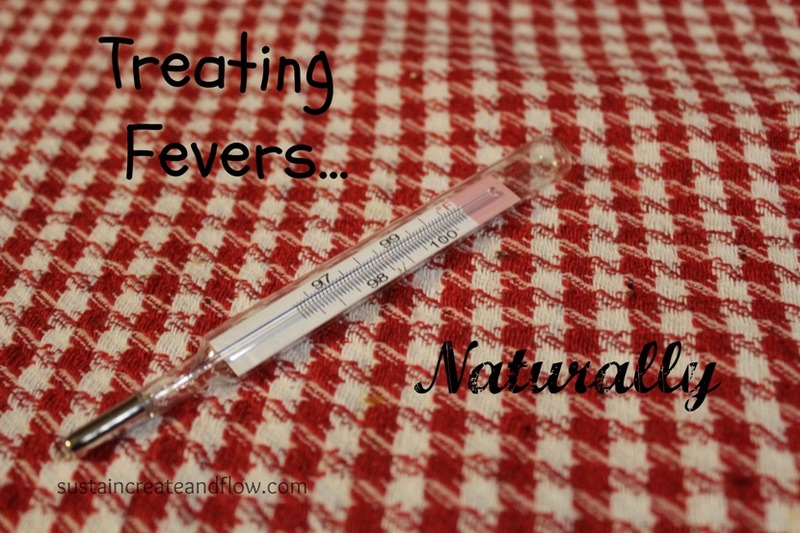 In my quest to understand fevers, I learned that low to mid grade fevers are indeed beneficial and should not be masked or reduced and doing so could be counter productive actions to the healing process. Fever grade is also not a good indication of how sick the patient may or may not be, so it is best to pay attention to the symptoms and not the number on the thermometer. There is a lot of research supporting this ‘philosophy’ (if that is even the right term for such things), and the benefits of fevers have been acknowledged for centuries. At the onset of the 20th century, however, the pharmaceutical companies had begun their wildly successful campaign to drug the general population, and so convinced the masses that fevers needed to be reckoned with and nullified. The successes of the early aspirin campaign can still be seen today in the way we view and “treat” our fevers, along with many other illnesses. Whatever camp you fall into, fever reducing or not– you must always do what is best for your family. The parent always knows what is best for their child, and there is definitely a time, (and a very much appreciated) place for modern, allopathic medicine. Every situation is different and a one-size-fits-all approach is not a realistic strategy for dealing with illness. There are many options available and you should pick which ones are best for you at the time. Fever is the body’s natural response to infection, during which the body sequesters iron and zinc in an effort to heal itself. Fever, even at 102 degrees F, is well tolerated by a child and the increase in body temperature helps to kill bacteria in the body and help the body defend itself. Fevers themselves are not dangerous–it is the infection that causes it that is the danger. It is more important to make the patient comfortable and relieve symptoms than to reduce the fever. 107.6 degrees F is the temperature that begins to cause brain damage in humans. Fevers caused from infections rarely, if ever go over 106.2 degrees F.
Checking temperature from the arm pit will generally give a reading 1-2 degrees lower than the actual temp. 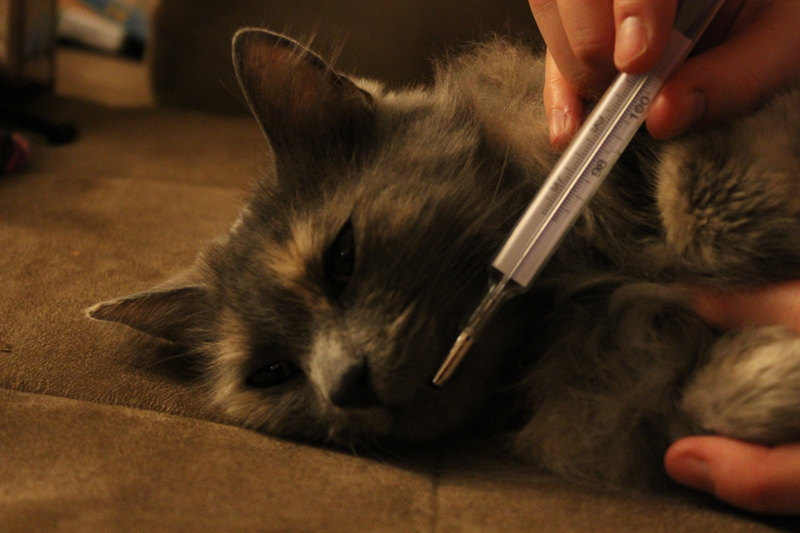 Checking the temperature rectally will generally give a reading 1-2 degrees higher than the actual temp. Treating a fever is an issue of comfort. To reduce a high fever do so by sponging or bathing in tepid water. Hydrate! 4 ounces of water every hour for ages 6 and under. 8 ounces of water every hour for ages 6 and up. Electrolytes only need to be added in the case of diarrhea and prolonged fever. Cold water is not recommended and can cause shivering. (When the body shivers it increases it temperature–not the goal). No alcohol baths. Older wisdom used to suggest bathing in alcohol because of it’s cooling and quick drying effect on the skin, but it is not recommended for children. Do not force a sweat. Do not suppress a fever. Use natural therapies for comfort so the body can fight off the ailment effectively. Don’t give aspirin in under 18 years of age. (Reyes Disease). Use Ibuprofen (first choice) and then Tylenol if needed. Ibuprofen is quite effective with high fevers. “Magic Socks,” or “Wet Sock treatment.” You can view the details here. Fevers in babies under 3 months warrant a trip to the doctor asap. Steam inhalation of a bowl filled with hot water with 2-3 drops of eucalyptus essential oil to open nasal passages and bronchi for children ages 7 and up. Salt water gargle with older children who are able. “Magic Socks,” or “Wet Sock” treatment. You can view the details here. Healthy gut flora creates an intestinal barrier against bacteria. Stomach acid is the first line of defense killing off harmful bacteria that enters through the mouth, and whatever escapes that defense is handled by a probiotic. Beneficial bacteria is produced during the culturing of the foods and consuming them is the best way to maintain healthy gut flora. Not all kids are going to be into these generally sour tasting foods, so thankfully probiotics can also be supplemented. Two brands recommended were Seroyal brand (which is physician grade but can be purchased online–try iherb.com) and Jarrow brand. Vitamin C granules were recommended to be added to water (and with stevia if you are so inclined). That method was also a crafty way to increase hydration in children if they won’t drink their water. The frequency of taking vitamin C is said to be more important than the dosage, due to the fact that vitamin C, like any anti-oxidant in destroying bacteria, or free-radicals, dissipates quickly. Through a very scientific process that I don’t care to explain, it donates an ion to another ion of a bacteria, and is then used up. (At least that’s what I think she said…) Point being, once vitamin C does it’s very specific job, it is used up, so you’ll need to re-apply often. Reminds me of sunscreen. You can find vitamin C in a pill or powdered form. I like Emergen-C packets. Just don’t get the raspberry flavored ones, because they have added cane sugar to that flavor now. (Epic fail, Emergen-C)! Zinc smothers the virus/bacteria, and lozenges and nasal gels are the most effective applications for respiratory ailments. I personally take a combo in pill form when I’m sick of Vitamins A,C,E, and Zinc. It’s made by one of my favorite brands, Carlson, and has helped me a lot this past season. Look for zinc acetate and zinc gluconate. The ingredients of citric acid and tartaric acid should be avoided if possible. It’s not always easy, so if the choices are zinc with those ingredients or no zinc, opt to take whatever zinc you can. Bovine sourced, without rBGH. Colostrum, or liquid gold, is rich in antibodies and supports a whole host of ailments. Symbiotics Brand was recommended to be good. This suggestion is not for those with a dairy sensitivity. Note: Many of the herbs suggested in this post, such as elderberry, can be found in bulk along with other ingredients and finished products at Mountain Rose Herbs. It is my favorite and trusted source for health and wellness supplies. Olive leaf is a new herb for me, but after hearing it spoken so highly of, it is definitely something I will seek out for my herbal medicine chest. It is anti-microbial, but should be taken in conjunction with probiotics. Since it comes in capsule form, it is only suitable for older children. It was suggested that it may help to relieve allergies as well. The suggested dosage was 2 capsules 3 times per day for prevention during cold and flu season, and to bump up the dosage dramatically during illness to at least 10 capsules per day. The doctor giving the seminar told of how she survived medical school relatively healthy and unscathed by the rigors of schooling by regularly taking olive leaf. (Also, she told of her collegue who had cured himself of Lyme Disease with olive leaf. Just a helpful FYI if anyone out there is suffering). Siberian Ginseng is an adaptogen. It helps your body tolertate stress better and use stress hormones effectively. It can also be taken as a preventative. A recommended brand was Herb Pharm, who had an alcohol free option for kids and also Eclectic Institute who has a solid extract, which is like a very thick syrup. Studies have suggested that Vitamin D does nothing to prevent and treat colds, but that is not a widely accepted idea among all health care professionals. Where I live, most are vitamin D deficient, so we supplement with vitamin D anyway. A simple test can be performed before supplemeting, to make sure it is necessary and how much of a supplement would be needed. Excess vitamin D can cause calcification deposits in the body, so it is best not to go willy-nilly in excess with this vitamin. A thought is that the wintertime deficiency of vitamin D contributes to the cycle and spreading of colds. The sun is by far the best source of vitamin D, but supplements can be given, liquid being the best. It was recommended that below age 5, 35 units could be given per pound of body weight, per day. Vitamin A is a strong anti-viral. It can be taken at high levels to cure illness, but should not be sustained at a high dosage. Echinacea being the long-time favorite for colds and is very effective in shortening the duration of colds. It is easily accessible and found in many forms, a popular one being a tea. It is common to find echinacea with goldenseal, which is also a very effective herb in its own right. Goldenseal is currently endangered though, so the ethical thing to do is to avoid it. A local herbalist in town suggested Oregon Grape to be a great substitution, so that is what I tinctured when making my cold and flu tincture for the season. It wouldn’t be practical for a sick person to take all of these supplements when ill, but this list is a great resource for knowing what herbs will support the body best in times of cold and flu. Another hugely important factor when taking care of yourself and your family is the having the wisdom of knowing when to treat at home, and when to seek help! Some things are best left to the doctors, and sometimes not even “Doctor Mom” can fix them. *As always, the Author is not an expert or a doctor. Nor is she a butcher, or baker, or candlestick maker, and thoughtfully encourages you to do your own research on topics of interest to you. The remedies suggested are not a substitute for professional medical advice. Bookmarking this one for the fever remedies! My ND has me on many of the vitamin supplements you mention. Keeps my immune system cranking along – haven’t been sick except for a minor cold and that’s after several months of baby-induced sleep deprivation! My husband is a Physician Assistant, he’s right there with you… up to the herbs and probiotic part… that’s a little too “crunchy” for him. 🙂 It just makes me wonder when/how did we get to the point where fevers at 100 are bad? Thanks for the info! I think the idea that a fever over 100 is “bad” comes from schools using that as a guideline for what makes a kid too sick to come to school. Yes, if your fever is over 100, you are probably contagious and/or too sick to learn well, so you should stay home–but that doesn’t mean you need to reduce your fever. Aw, I hope your little guy gets well soon! We feel exactly the same way! We let the kids sweat it out and usually our illnesses are very short lived. The human body is amazing!!!! Great post. My wife is a family practice doctor and she agrees. If the temp isn’t over 102 let it work, it is happening for a reason. Like you stated infants are a different case, and temps over 102 in children can cause febrile seizures, but other than that leave them be. You are right, the drug companies have most people duped into medicating any little thing. I am so glad I saw this on Wildcrafting Wednesday. Sounds like a great lecture. Maybe I should have mentioned my wife is a D.O., and I think their philosophy in general differs from M.D.’s. Thanks again. So many great ideas and points here. I don’t know about you, but when my kid is sick I kinda lose it and get a bit panicky… so this is wonderful info for helping me keep my head straight! Wow, this is so interesting. I had no idea! Thank you so much for sharing on the frugal, crafty, home blog hop! Jordan, I didn’t know for a long time also. I am glad to spread the word 🙂 Thanks for hosting your great blog hop, I appreciate the opportunity to participate! What a great article! I used to run my daughter to the doctor at the first sniffle! I leaned better after a couple years and now we all stick to the “let it run it’s course” thought processes! I am glad I read all of your information! Here in Australia the general rule of thumb is that if the child is over 38.5 C or in discomfort we medicate first with paracetamol and then later with ibuprofen if the paracetamol does not have good effect. Febrile convulsions only happen in about 3%of the population and often occur due to rapid changes in the child’s temperature rather than a fever. After about 6 years of watching rather than treating a fever my kids are rarely ill and if they do succumb they are usually on the mend after 24 hours.